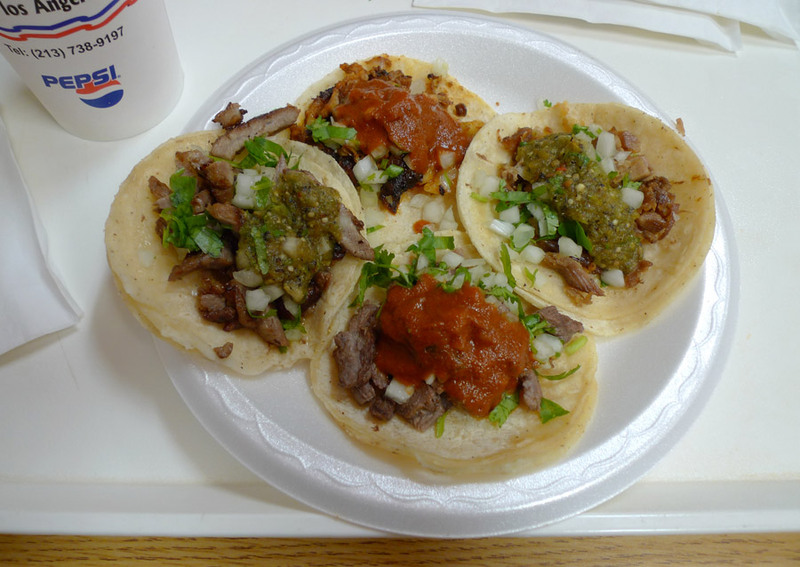 A few weeks ago friend and colleague Zinayda recommended El Taurino, and then when I looked it up, I discovered that the whole internet likes it as well, and that El Taurino is a sibling of King Taco, which recently I so enjoyed. Carmen and I decided to go there this Friday evening for dinner – I couldn’t help it, I was craving al pastor. 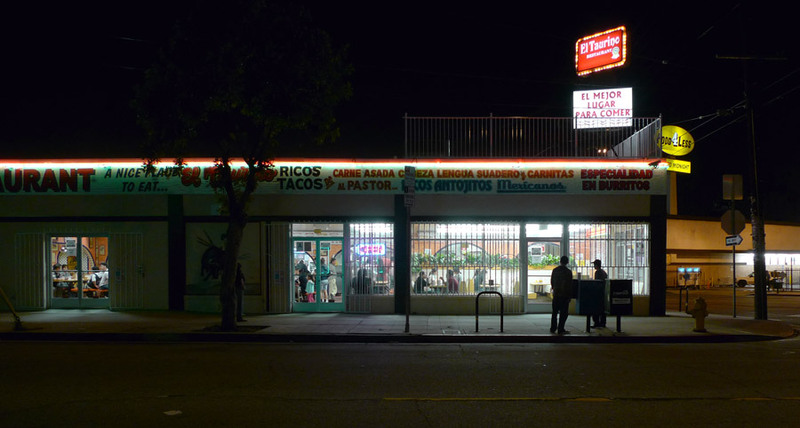 We drove to their Pico-Union location and found a taco truck serving tacos in their parking lot, apparently supplementing the action in the restaurant proper; but it seemed like going inside for the restaurant experience was the thing to do. We might have spent 15 minutes waiting in line, though. I tried not to think about how I would have been eating already had we gone with the truck. The interior is classic Mexican restaurant style, with a spacious dining room, in which the experience is marred only by the constant calling of order numbers over the loudspeaker. The dining experience is greatly augmented by the wall-to-wall bullfighting decorations, and actual taxidermy trophy bull heads mounted on the walls. And it’s called “El Taurino”. This place wants you to know that cattle aren’t just something you happen to be eating, but also a mighty and honorable beast cruelly taunted and murdered for sport! Click here to see my photo of the restaurant interior on Flickr. Tacos were $1.25 each, and the menu similar to that at King Taco. I chose one each of carne asada, al pastor, carnitas, and suadero, and responded affirmatively when asked if I wanted them spicy. They are somewhat small to average in size, so four make a good meal. The tortillas are the normal kind, fully bilam’d. First I ate suadero, delivered with a tasty peppery green salsa. This was my favorite of the four – the strips of beef filled the tortillas well and offered great texture and beefy flavor. Next I ate carne asada, which was coated in a smooth red salsa. I took a couple bites and found the steak moist and tasty, fairly spare in its treatment but citrusy. By the third bite, the heat of that smooth red salsa had gone into effect. The green salsa on the suadero was unusually hot, but the rojo on the asada is potent. It’s Franka Potente. I’m pretty sure this was the hottest taco I’ve ever eaten. Is this heaty taco the reason that the majority of the clientele at El Taurino appeared to be Korean? Everything I tasted after this moment was mediated by that heat. I ate carnitas next, which was delivered with the less hot verde, but through the veil of the hot afterburn of the red, it could have been soggy cardboard and I would scarcely have noticed. It seemed okay, but I won’t presume to judge it. The al pastor was delivered with the now-legendary rojo as well. I eyed it warily. Carmen encouraged me to scoop off that rojo, but I’m not the kind of man who would do any such thing – this taco needed to be eaten the way it was meant to be eaten. But I did take a bite of al pastor at fork’s end before I got into the taco per se. It was very good, cut from a real rotating spit that you can look at, orange and black, and very sweet, caramelly. Then I ate the rest of the taco and was plunged back into the land of heat and fire. El Taurino was awesome. It’s not so hot that tears run down the face, but the heat still shows you who’s boss. What it lacks in subtlety is obscured by the visceral experience of fiery rojo.